We have a color challenge this week! We challenge you to make cards for our heroes to send home to their loved ones using GREEN & PURPLE. I can’t wait to see your interpretation of our challenge! 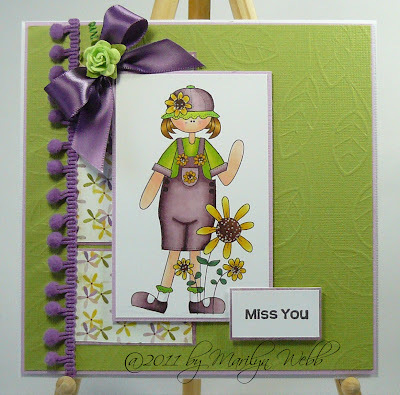 Our sample card maker this week is Marilyn, to see more of her fabulous art work please visit her blog Marilyn’s Card & More. Thank you Marilyn for sharing your awesome creativity with us! Who wouldn't love getting this great card. Love the purple ball fringe. Marilyn, your purple and green card is just GORGEOUS! Awesome coloring!! Love the ball fringe! Fabulous coloring on the image, too. Love the embossed background.